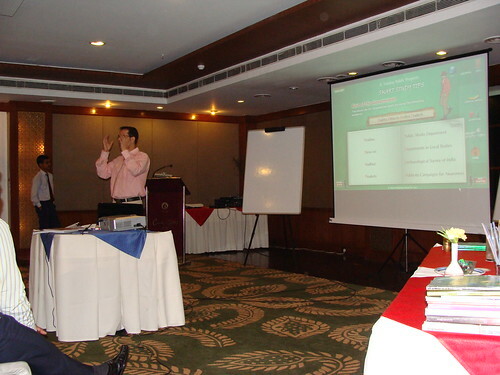 See me conducting a workshop on the new e-learning projects of Madhubun Books for the national sales personnel. The event is a part of Madhubun’s annual National Book Launch Conference held between October 4-6, 2010 at Hotel Clarks Shiraz, Agra. It was participated by a strong audience of 200 professionals comprising 150 Madhubun sales personnel and 50 invited dignitaries that included authors of Madhubun books and principals and senior teachers of leading schools from Agra, Kanpur and Lucknow. Dignitaries also included, among others, Sajili Shirodkar, Director, Vikas Publishing; Deepa Baruah, Editorial Manager, Madhubun Books and Sanyukta Ludra, Editor-in-Chief (Hindi), Madhubun Books. Filed under: Children's Educational Books, author meet, book launch, books, cbse, cce, cce made simple, children, curriculum, editors, India, Madhubun Books, new syllabus, parenting, reading habit, sales workshops, Vikas Publishing House Pvt. Ltd.
Did you enjoy reading any of my blogs? If yes, do support me in continuing to provide you with free, useful essays, discussions and articles on road rage, Ayurveda, children's educational books, children's literature, current news, general awareness, heresy, philosophy, relationships and web metrics. My future plans include a unique blog on "Word of the Day" and another on "Flash Prose." Needless to say, all these will be offered to you free of cost! Subscribe to my Blog by providing your email ID in the Follow Blog via Email section above. Devaleena Joardar on Are We Still a Democracy? Unauthorized use and/or duplication of the material (in the form of text, images, graphics and/or any other media) appearing in this blog without express and written permission from this blog’s author and/or owner is strictly prohibited. Excerpts and links may be used, provided that full and clear credit is given to Ranjit K Sharma with appropriate and specific direction to the original content. For copyright permission, the author can be contacted by sending a mail at ranjitdear@gmail.com. Author does not patronize and is not responsible for third-party or external links appearing on this blog.